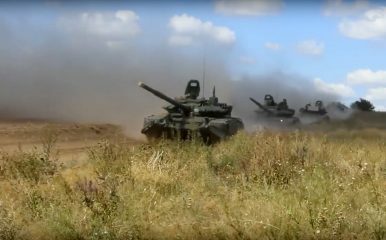 In this photo taken from video provided by Russian Defense Ministry Press Service on Tuesday, Sept. 11, 2018, tanks roll during the military exercises in the Chita region, Eastern Siberia, during the Vostok 2018 exercises in Russia. Russia began holding its largest military exercise in almost four decades on Tuesday. The Russian military began its largest military exercise in almost four decades in Siberia and Russia’s Far East on September 11. Code-named Vostok (Eastern) 2018, the five-day exercise will reportedly involve around 300,000 troops, more than 1,000 aircraft, and up to 36,000 tanks, armored personnel carriers and other vehicles, as well as up to 80 ships and other vessels, according to the Russian Ministry of Defense. In size, it will be the largest Russian military exercise since Zapad (Western) 1981, held in 1981 in the Soviet Union’s Belarusian, Kiev and Baltic Military Districts and in the Baltic Sea amid growing tensions with the United States following the inauguration of U.S. President Ronald Reagan. There is good reason to believe, however, that the numbers of troops and military equipment involved in this week’s exercise are exaggerated for domestic political reasons. Given that 300,000 military personnel would constitute one third the entire Russian military, the number is likely much lower around 50,000 to 100,000 at the most. The financial cost for moving around 30 percent of the entire Russian military establishment would not only be exorbitant given the shrinking Russian defense budget and Russian military commitments elsewhere in the world, but moving around that many troops and materiel would also paralyze the Russian military’s logistical support infrastructure. Given that the Russian military, according to a conservative estimate, in its Central and Eastern military districts, has a mere total of 7,000-10,0000 tanks, armored personnel carriers and other vehicles deployed, moving an additional 25,000 military vehicles from its more Western military districts would take several weeks and clog up all major Russian railways and highways. As of this week, there is no evidence that such traffic jams have taken place in August or September. The exercise does not come as a surprise to Western military observers. The Russian military has a four-year cycle with scheduled military exercises (snap exercises by their very nature occur unannounced) rotating annually between four Military Districts: Zapad (Western), Vostok (Eastern), Kavkaz (Southern) and Tsentr (Center). What makes this year’s Vostok’s exercise, however, special is its scale and the participation of a foreign military power. Interestingly, Chinese media has released pictures that show a contingent of the PLAs most advanced third-generation MBT, the Type 99 (ZTZ-99) — possibly the Type 99-A variant — crossing into Russia by train. (According to a Diplomat estimate, the PLA currently possesses a little over 600 ZTZ-99 and ZTZ-99A.) The fact that the PLA is sending some of its most modern military equipment to Russia illustrates the importance that Beijing is assigning to the exercise. While the PLA has been invited to joint military drills before (for example, China and Russia held a joint anti-ballistic missile defense computer-simulated command post exercise in Beijing in December 2017), it the first time that China is participating in Russia’s annual strategic exercises that provides training mobilization, deployment, and operations in a multi-theater war. Beijing and Moscow have a comprehensive strategic partnership but not a military alliance. “This handicaps deeper military cooperation between the two countries and makes exercises that practice complex integrated military operations difficult if not impossible to conduct,” I explained previously. In short, Sino-Russian military drill cannot achieve NATO-like interoperability. Indeed, both sides have also repeatedly stressed the non-alliance aspect of their military cooperation in the past. Furthermore, the origins of the Vostok exercise was to prepare the Russian military for full-scale (including nuclear) war with the People’s Republic of China. It is thus unsurprising that China’s MoD insists that this is not a joint China-Russia military exercise, but rather marks Chinese participation in a large-scale military Russian exercise. The principal reason for Beijing’s involvement is thus to deepen military ties between the two countries on the one hand, but, perhaps more importantly, to also assuage Chinese fears about Russian military activity near China’s borders on the other. Notably, General Valery Gerasimov, the chief of the General Staff of the Armed Forces and the first Deputy Defense Minister of Russia, as well as the Russian Ministry of Defense called Vostok 2018, “strategic maneuvers” rather than a strategic command-staff exercise– technically a higher level of exercise in the chosen theater of military operations. The gist of the exercise is the simulating of a large-scale conventional war featuring an Eastern force composed of the Eastern Military District, the Russian Pacific Fleet and the Chinese contingent, conducting conventional warfare operations against a Western force composed of units of the Central Military District and the Russian Northern Fleet. The enemies in this scenario are obvious: the United States and its allies. Vostok 2018 will also have a nuclear command and control component, as the exercise is expected to include simulated nuclear-weapons attacks. However, it is unclear whether this will be a separate exercise independent of the training scenario of Vostok 2018. It is also unclear whether it will involve the simulated deployment and use of tactical nuclear weapons. Nonetheless, what is relatively certain is that any scenario involving nuclear weapons will include “nuclear escalation control” scenarios to practice the threshold of nuclear weapons use during a large-scale military conflict with a peer-competitor. Some weapons systems to keep an eye out for during Vostok 2018: the short-range nuclear-capable road-mobile 9K720 Iskander-M (NATO reporting name SS-26 Stone) ballistic missile system; Project 955 Borei-class (“North Wind”) aka Dolgoruky-class nuclear-powered ballistic missile submarine (SSBN); the S-400 Triumf advanced interceptor-based air defense systems (NATO reporting name: SA-21 Growler); and the third-generation T-14 Armata main battle tanks (MBT), among others.